Burning Reels from Wazdan combines interesting theme, loads of action and fantastic extra features, so players are not going to get bored with this game. Burning Reels is equipped with 5 reels, 20 paylines and it shows the dangerous job in the fire department. With this kind of theme it is not a surprise to see on the reels symbols presenting helmets, fire trucks, badges, fire hydrants, fire extinguishers and even a helicopter that helps to save lives. Describing symbols it is worth to take a closer look at their design, as it can be clearly said that Wazdan put a lot of effort to make this game look so good! It doesn’t matter if you use laptop, tablet or other mobile device to spin the reels of Burning Reels, as this game on each and every device looks simply stunning! Another advantage of this game is a soundtrack, which perfectly fits the theme of this game. Fast, electronic music builds the impression of continuous action, so be prepared for unforgettable thrills. Games from Wazdan feature not only fabulous graphics and highly engaging themes, but also various extra features that both provide top-quality entertainment and extra chances to win higher prizes. In Burning Reels slot game you can take advantage of such features as Wilds, Scatters and Multipliers, so let’s begin the action! 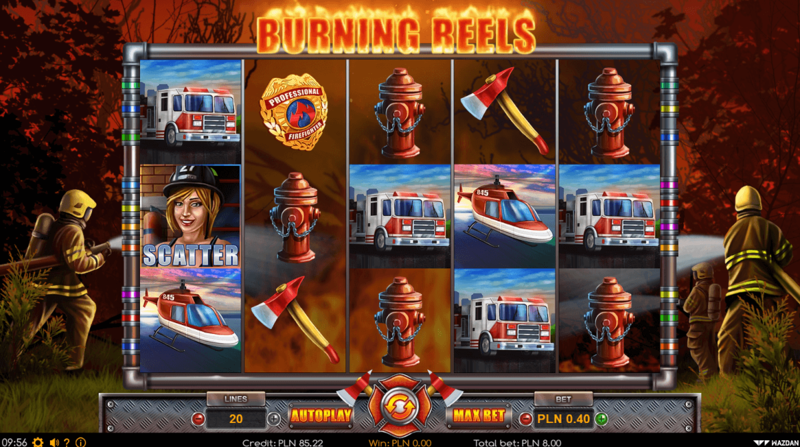 A firefighter in full equipment is a Wild symbol, meaning it has a special ability to replace any other symbol appearing in the game, what massively increases the winning potential of the Burning Reels slot. The only symbol that can’t be replaced by Wild is a Scatter, which appears in the shape of beautiful girl wearing black helmet. So what is Scatter then? This is another special symbol, but its job is to unlock Free Spins bonus feature. However, to make things a little more complicated, to trigger Free Spins player has to lay in line at least three Scatters and the combination has to start on the first reel on the left. Then player gets 10 Free Spins to play with and it is worth to catch bell symbol on the middle reel during this feature, for this symbol doubles all prizes! In Burning Reels there is also cool risk mode which can be fired up after each and every win, just by pressing gamble button on the main screen. Then a new window occurs and player is put in fireman’s shoes and takes part in real action where he must decide which one of two bushes to extinguish. The successful action doubles the prize and it is possible to play this mode 7 times in a row, what can bring really huge prizes! In conclusion, Burning Reels is an amazing casino slot game that will deliver lots of fun for very long hours. Interesting theme, great graphics and attractive extra features will make you to come back for more!